"This is a wonderful resource for all kinds of family and Christian DVDs and Videos... I have used it many times and I have always been happy with the service received." Take The Love Dare everywhere. 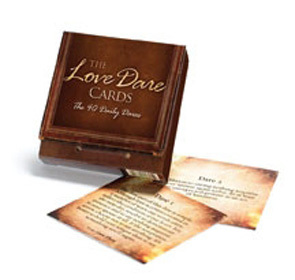 The 40 daily dares featured in The Love Dare are printed on individual cards that fit easily into your purse, the corner of your mirror, a shirt pocket, etc. Dare to love. Every Day! Padded hardcover gift book with ribbon marker. Arm yourself with these 40 prayer cards to use in your personal War Room! Clad in an embossed simulated leather binding, Dare to take The Love Dare, and see your marriage change forever. Make this more than a year of your life. Make it your bold, next step to a lifetime of love.